Podemos' crowds celebrate huge gains in Spanish general elections, Madrid, 21 December 2015. Demotix/Michael Debets. Some rights reserved. Edward Snowden’s congratulatory tweet on December, 20 was posted at 9.40 pm, when the election results, giving the new party 18% of the seats in parliament, were almost final. Snowden, a true new millennium star, added a link to one piece from The Guardian, which highlighted the emergence of Podemos and the end of the two-party system in Spain. He was not the only one. Nor was he the first. Ever since the surprise results of Podemos at the May 2014 European elections, praise and support for Podemos have been coming in from all over the world. Not only that: in some European and American countries there are people busy trying to replicate the experience of Podemos in a variety of ways. While the Spanish caverna mediática (the powerful rightwing media apparatus) lambasts Pablo Iglesias’s party, Podemos keeps drawing increasing international attention. Pepe Mujica, the admired former president of Uruguay, said a few months ago that Podemos is "a warning roar in the contemporary world". Eduardo Galeano identified Podemos with empowerment: "Podemos, you are the enemies of impotence". Luiz Inácio Lula da Silva, former president of Brazil, wished Pablo Iglesias’s party success at the December 20 general elections and avoided doing the same with his traditional ally, the Spanish Socialist Workers Party (Partido Socialista Obrero Español - PSOE). Declarations of love have been coming in from Europe too. Filmmaker Ken Loach declared that Podemos "should be the banner of the European Left". And Julian Assange, the founder of Wikileaks and a new era icon, stated that Podemos is the "first party of the 21st century". But fascination with Spanish political developments after the 15M outbreak goes beyond Podemos. The “municipalist” confluences – that is, the citizen fronts that include Podemos - which conquered the main cities in Spain at the last local elections, is a phenomenon that has also had a deep global impact. Ada Colau and Manuela Carmena, the current mayoresses of Barcelona and Madrid, are being pronounced as true heroines of change. And different cities around the world are studying the methods, technology and narrative of Spanish municipalism. However, despite the impressive score at the recent general elections – Podemos is now the third party in Spain and the first party, through ad-hoc configurations, in Catalonia and the Basque Country – the Spanish political and media system tries hard to de-legitimize anything that has to do with Podemos, including Manuela Carmena’s and Ada Colau’s governments in Madrid and Barcelona. What is it exactly that so frightens the Spanish establishment? Why does the Spanish Left, especially Izquierda Unida (United Left), shun the rise of Pablo Iglesias? Why does all that hovers around Podemos inspire citizens, intellectuals, politicians and movements around the globe? The perception of Podemos in Europe and Latin America, which is where the party is mostly talked about, is substantially different. Europe is fascinated with the energy, optimism and popularity of Podemos. It sees its network and street-level participatory framework as a shot of inspiration for the birthing of a new continental Left poised to change the European Union neoliberal course. British political scientist Owen Jones, possibly the greatest defender of Pablo Iglesias’s party, in an article titled What I learned from Podemos, offers a comprehensive review of what Europe can learn from the new Spanish party. Highlighting the importance of the Spanish social ecosystem, the15M movement and some other movements such as the Mortgage-Affected Citizen Platform (Plataforma de Afectados por la Hipoteca - PAH), Owen singles out what, to his view, is the most important contribution of Podemos: the giving up of the methods and symbols of the old Left. "The colour of Podemos is purple, not red. It is hard to find words like Socialism in its leaders’ speeches. Podemos even refuses the Left-versus-Right terminology, choosing instead “People-versus-Elite”". Owen Jones emphasizes Podemos’s "enthusiasm" and "bright optimism". Most European observers, in addition to considering Podemos a driver for the renewal of the Left, also highlight its democratizing potential. Thomas Piketty, professor at the Paris School of Economics, notes that "Podemos carries hope for the democratizing of the Eurozone”. British author Paul Mason (PostCapitalism: a Guide to our Future) considers, in a recent article, that the Spanish cities governed by confluences, especially Manuela Carmena’s Madrid, are the great hope for building a new city model based on collective intelligence and citizen collaboration. Renaud Lambert, the editor of Le Monde Diplomatique, wrote an article in early 2015 in which he asserted that Podemos is "the party that is changing Spain", for it is "translating the Left’s traditional discourse into discursive coordinates which can gather an increased popular base: democracy, sovereignty and social rights ". The leftist German weekly Der Freitag devoted its April front cover to Podemos with the following headline: "Why the Podemos movement can change Europe". On the other hand, European media usually associate Podemos with the Greek coalition Syriza and the anti austerity policies that are being demanded in Southern Europe. But in recent times, even Financial Times columnists such as Wolfgang Münchau have been siding with the purple party’s economic prescriptions on debt restructuring. Generally, the Left and the European intelligentsia regard Podemos as the best recipe to put an end to the "extreme centre" – a metaphor used by Tariq Ali to describe the Labour and Socialist parties that have turned themselves in to neoliberalism, austerity and the EU’s mother-ship. In February 2015, Pablo Iglesias made a strategic US tour. He met with renowned economists Joseph Stiglitz (Nobel Prize in Economics in 2001) and Mark Weisbrot, co-founder of the influential Centre for Economic and Policy Research (CEPR), who was full of praise for Pablo Iglesias. The leader of Podemos also spoke with social movements and a number of key intellectuals of the American Left. His appearance on Amy Goodman’s Democracy Now talk show, an emblem of the American Left, was especially important. The dialogue between Iglesias and Goodman at the University of New York, organized by the prestigious Left Forum, had a spectacular attendance. And some influential critical thinkers, notably Noam Chomsky, have repeatedly emphasized the importance of the new Spanish party: "Podemos is a party which stands up against the neoliberal assault that is strangling and destroying the peripheral countries in Europe." For her part, French-American author Susan George claims that Podemos "has the correct stance on climate change and TTIP (the Transatlantic Trade and Investment Partnership between the United States and the European Union ,currently under negotiation). Latin America has a special relationship with Podemos. The fact that Podemos is embracing some of the political theories of Argentinean theorist Ernesto Laclau, such as the "hegemony" concept or the "construction of a people", raises some concern in a region where the progressive bloc’s narrative is on the decline. However, a good part of the Left and the Latin American movements feel that Podemos’ strong winds can become a renewing hurricane, especially in terms of building a new narrative. In Mexico, Andrés Manuel López Obrador has founded a new party, the National Regeneration Movement (Movimiento Regeneración Nacional – MORENA), a self-proclaimed "Mexican Podemos" that is experimenting with the party-movement formula. In Brazil, where the Spanish 15M social effervescence has had a large impact, Podemos arouses passions. Late in 2014, some dissidents from the Rede Sustentabilidade launched the Raíz Movimento Cidadanista (Root Citizen Movement), which has been hailed by the media as “Brazil’s Podemos”. The Circulos de Cidadania (Citizen Circles) in Rio de Janeiro were also activated mirroring the Podemos’s circles, and aim at reinventing political participation and the people’s storytelling. The interest in Brazil runs so high that a top selling book this year was Podemos e Syriza: experimentações políticas e democracia no século 21 (Podemos and Syriza: political experiments and democracy in the 21st century). The last third of the book is devoted to the municipalist confluences governing the some of the main cities in Spain, including Madrid and Barcelona. And here is a clue: the emergence of Podemos has generated an influence and an asymmetrical, organic and symbolic inspiration that exceeds the party itself. In Brazil, Ahora Madrid or Barcelona en Comú (Carmena’s and Colau’s confluences) have been as influential as Podemos itself, if not more. In Belo Horizonte, one of Brazil’s main cities, a local confluence is currently under construction: Muitxos: Cidade que Queremos (Many: the City We Want) following the steps of the Spanish municipalist model. In Mexico, the Wikipolítica movement that has managed to get the first Mexican independent congressman elected, Pedro Kumamoto, clearly echoes the Spanish municipalist conception. While the Spanish powerful rightwing media apparatus, the Old Left (Izquierda Unida) and the extreme centre (PSOE) criticize Podemos’s phenomenon, there is a planetary echo that feeds on its energy, its practices and its narrative outstripping the classic revolutionary symbolism. There have been some issues concerning the internal democracy of Podemos, which are the main object of criticism levelled by Spanish social movements, but it could be said that the purple party is becoming a watershed in global politics. Portuguese philosopher Boaventura de Sousa Santos talks about the Podemos Wave. In a March 2015 article, he stressed that Podemos is not a Southern European or Latin American phenomenon. Quoting the Indian Aam Aadmi Party (Party of the Common Man), Boaventura de Sousa Santos predicts that what he calls the Podemos Wave "can emerge under different features on another continent or context." In fact, Podemos’ significant burst into the Spanish parliament during the past general elections has been praised by several emerging parties worldwide. For example, the Turkish Peoples’ Democratic Party (HPD), born after the Gezi Park riots in Istanbul, celebrated via Twitter the end of the Spanish two-party system. 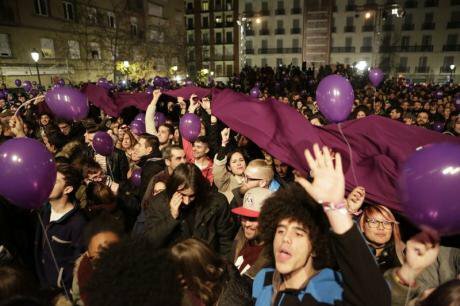 The Podemos Wave, whatever may happen in Spain, will continue. The Wave may expand and even generate some improvements in the participatory methods so far implemented by the purple party. Ultimately, it is a breath of fresh air for the world’s Left. The Podemos Wave – according to Boaventura de Sousa Santos – "is a metaphor of the quest for a political solution to the progressive impasse in which we find ourselves, a solution that does not entail an abrupt political breakdown".